See the tombs of popes and the location of Saint Peter’s tomb in Virtual Reality. This short VR movie includes a narration that explains the history of and other interesting facts about the Vatican grotto below St. Peter’s Basilica. The Basilica was built on an ancient cemetery, and it’s crypts have become the burial places of popes for centuries. Under the Basilica are also chapels. One of them, highlighted in this video, is the Chapel of the Madonna of Bocciata. In it, find the fresco of the Madonna of Bocciata, painted by the 14th century artist Pietro Cavallini. She is named “Bocciata” (rejected) because of here swollen face. According to an old legend, her face in the painting miraculously bled when a drunken soldier angrily threw a bowl at it after he lost money in a game. This is a great video to show to RCIA classes and youth in religious education classes. Please share this post with the catechists you know! 1. Why do we say that Peter was the first pope? 2. 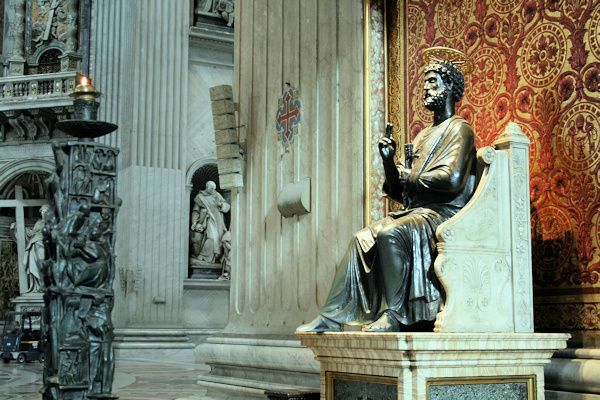 Saint Peter’s tomb is directly under the main altar of St. Peter’s Basilica. Why do cathedrals and basilicas have tombs in a basement area directly under the altar? Who’s Who in the Catholic Church is a PowerPoint presentation for catechists to explain the institutional, hierarchical structure and organization of the Catholic Church and the roles of everyone from the Pope to the Laity. This entry was posted in VR Experiences on January 25, 2019 by Terry Modica.